The Municipal Art Gallery, Darlington, Co Durham : 1969, 1977, 1988 & 1999. The Civic Theatre, Darlington : mid 70's. Durham Art Gallery Print Room : 1999. The Hutchinson Gallery ( now the McGuinness Gallery ) Bishop Auckland Town Hall, Co Durham : 1995. Great Aycliffe Show : 1993, 1994 & 1996. Greenfield Art Gallery : 2002. 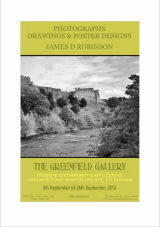 The poster ( right ) gives details of my next solo exhibition - with the featured b/w image being of Richmond Castle in Yorkshire - taken from my book : THIS & THAT - A Photographic Album, which was released on the 1st of August 2012.